Being aware that he had only few years left for public ministry, Jesus selected 12 apostles from his disciples to train them as part of his succession plan so that they might continue his mission through the church that he was going to establish. The selected people were not highly intelligent, wealthy, or of high status in the society. They were from different walks of life like fishermen, tax collector like Matthew, Zealot like Simon and even self-centered Judas Iscariot who betrayed him. Jesus made them learn from him and by practicing the preaching and healing under his supervision. The apostles did their mission well during their lifetime and made their own succession plans so that the church ministry continues until the second coming of Christ. We are the people to continue the mission of Jesus in this age. However weak we are, Jesus wants us to take active part in his church. (13) He went up the mountain and summoned those whom he wanted and they came to him. (14) He appointed twelve [whom he also named apostles] that they might be with him and he might send them forth to preach (15) and to have authority to drive out demons: (16) [he appointed the twelve:] Simon, whom he named Peter; (17) James, son of Zebedee, and John the brother of James, whom he named Boanerges, that is, sons of thunder; (18) Andrew, Philip, Bartholomew, Matthew, Thomas, James the son of Alphaeus; Thaddeus, Simon the Cananean, (19) and Judas Iscariot who betrayed him. (13) He went up the mountain and summoned those whom he wanted and they came to him. (1) Mount Ararat where the ark of Noah landed after the deluge (Genesis 8:4) and where God made covenant with Noah. (2) Mount Moriah (Gerizim) where God had asked Abraham to sacrifice his son. (Genesis 22:2). (3) Mount Sinai where Moses met God and received the Ten Commandments. (4) Mount Nebo (Pisgah) where Moses saw the promised land. (Deut. 34:1-4). (5) Mount Carmel where Prophet Elijah proved God as genuine against Baal by calling down fire from heaven to ignite fire on water-soaked sacrifice. (1Kings 18). (6) Mount Zion (Jerusalem) where Solomon built the Temple. (7) Mount of Beatitudes where Jesus delivered the Sermon on the Mount. (8) Mount Tabor (Hermon) where Jesus was transfigured. Moses and Elijah also appeared there with him and the voice of God was heard. (9) Mount of Olives where Jesus prayed before his arrest. He ascended into heaven also from this mountain. (10) Golgotha (Calvary) was skull-shaped hill in Jerusalem where Jesus was crucified. He was buried near here and he rose from the same place. Like Moses went up to Mount Sinai to be with God, Jesus also went up the mountain to pray and he spent the night with God (Luke 6:12). He asked his disciples to come up to the mountain where he was praying. His selection of the 12 on the holy mountain was indicative of their divine call. They should be spiritually higher than the ordinary people and should be meeting God often like Jesus. Though Jesus had many disciples, why did he limit the number of apostles to 12? Twelve had been considered as a number of perfection for administration. Number three signifies the divinity (Trinity) and four stands for earth (four corners). Twelve is the product of three and four and thus a combination of heaven and earth. According to the divine plan, Israel was divided into 12 tribes under the names of the sons of Jacob. (Genesis 49:28). Tribal leaders were selected to represent these tribes for efficient administration under King David. (1 Chronicles 27:16-22). When Jesus started his public ministry as Son of David, he reestablished the rule of the 12 princes through the 12 apostles he selected on the mountain. This was indicative of the reestablishment of the old Israel in a new form. These 12 were not representatives of the 12 tribes originated from Jacob. Though they were Jews, they were to represent all nations whom God promised to bless when he made covenant with Abraham. God had told Abraham, “in your descendants all the nations of the earth will find blessing.” (Genesis 26:4). The meaning of apostle is one who is sent on a mission. Unlike the other disciples, these 12 had special role and authority in Jesus’ kingdom as representatives of Jesus. Besides the authority to continue the mission of Jesus in this world, Jesus promised the apostles: “you may eat and drink at my table in my kingdom; and you will sit on thrones judging the twelve tribes of Israel.” (Luke 22:30). The crowds, that came to hear the message of Jesus and to see him performing miracles, went away after some time. Many who came to get healing or resolution of their other issues left him after their needs were met. There were disciples who would spend more time with him. However, the 12 were always with him as companions and trainees. 1. Jesus was doing his public ministry at a time when there was no print media or electronic media. If he alone preached, the message of the kingdom of God would spread only slow. So, he wanted his ambassadors to go to various places and to perform the same task he was doing. 2. Jesus was training his apostles as part of his succession plan. He was sure that he would be in the world for a few years. However, his mission had to continue. So he had to select and train his disciples as his successors. During those days, there was a practice of outstanding students leaving their homes to study with their rabbi by travelling with him for a lengthy period of time. It was a total commitment spending one’s entire time listening and observing the rabbi. Thus the disciple will learn from the teacher how to understand the Scripture and how to practice that in life. The goal of the training was as Jesus said, “when fully trained, every disciple will be like his teacher.” (Luke 6:40). Besides the authority to teach, Jesus endowed his apostles with the power to drive out demons. Demons dominate in the world because of the fall of humanity to sin. Only God or persons of divine quality could drive them out. By closely following Jesus and by his commissioning, the 12 also got this power over demons. The apostolic vocation was a call from Jesus followed by consent and commitment from the apostles. Jesus had many followers called disciples. Disciples were admirers and followers of Jesus. Whereas the apostles were fulltime companions of Jesus who learnt from Jesus’ words and actions. They were also his messengers of the Kingdom of God during and after his public ministry. There were some common features and differences among the 12 apostles that Jesus selected and appointed for his mission. All of them were ordinary Jews, not experts in the law or the interpretations of the law, open minded, holding their own secular professions to support their families. Jesus avoided Scribes who were experts in the Scripture, Pharisees who were conservative and separated from the public, and Sadducees who were mainly priests. None of the members of the Sanhedrin were selected. He selected sinners like Matthew and zealots like Simon. All the 12, except Judas Iscariot, were Galileans. All the apostles, including Matthew the richest among them, left everything they had to follow Jesus and considered the Kingdom of God as their most valuable treasure. They left their family and formed a family with Jesus. The apostles were not sure of what kind of kingdom Jesus was going to establish. In fact they were confused on that issue. They were fighting for positions because of their misunderstanding that Jesus was going to establish an earthly kingdom. It was not their fault because such was the common belief on Messiah at that time. Within the three years of training, Jesus reformatted the mind of the apostles according to his vision. They were open to receive the message of Jesus and his Messiahship different from the common understanding of the time. All of them (Matthias in the place of Judas), received the Holy Spirit and continued the mission of Jesus. All of them faced challenges and persecution because they took up the mission of Jesus. They felt joy and satisfaction in their mission than in their previous way of life. All of them, except John the Evangelist, faced martyrdom. There were many specialties that made Simon Peter distinct from other apostles. 1. Though not educated, Peter had natural leadership qualities and Jesus made use of it for his mission. 2. Peter was not afraid of expressing his opinion by raising questions to Jesus. He took initiative as a spokesman for all the apostles. 3. Jesus had used Peter’s house during his ministry in Capernaum. 4. He was the one to openly express Jesus as the son of the living God. 5. When Simon professed his faith in Jesus at Caesarea Philippi saying “You are the Messiah, the Son of the living God.” (Matthew 16:16), Jesus changed his name Simon meaning "God has heard," to Peter (Rock). According to the Biblical concept, only a person who has authority will change the name of another person. The change of name was also indicative of a change in the identity or mission of the person. Among the apostles, only Peter had that privilege of Jesus changing the name. 6. Jesus gave authority to Peter saying, “I will give you the keys to the kingdom of heaven. Whatever you bind on earth shall be bound in heaven; and whatever you loose on earth shall be loosed in heaven.” (Matthew 16:19). 7. In spite of the warnings he had received from Jesus, he denied Jesus three times during the trial of Jesus. However, he had recovered from it through his genuine repentance. 8. He was the head of the college of apostles and thus the first pope. 9. Peter was crucified upside down upon his request that he was unworthy to die in same manner as his master. 10. His name and activities are recorded in the New Testament more than any other apostle. Like Peter and Andrew, James and John were brothers and fishermen. Zebedee, their father was a leading businessman of fishing. Zebedee had hired men to run the business. (Mark 1:20). Jesus had nicknamed James and John as Boanerges, that is, sons of thunder. This was because of their intense passion and enthusiasm. They, along with the help of their mother Salome, had asked opportunity to sit on both sides of Jesus in his kingdom. (Matthew 20:20-23). They were also the inner circle of Jesus along with Peter. These three were the only people allowed to accompany Jesus to witness raising Jairus’ daughter to life (Mark 5:37), to the Mount of Transfiguration (Mark 9:2), and to be close with Jesus in the Garden of Gethsemane. (Mark 14:33). James was the first apostle martyred and only his martyrdom is recorded in the Bible (Acts 12:1-3). He was beheaded at the order of King Herod Agrippa in 44 A.D. He was known as James, son of Zebedee, James the Elder or St. James the Great to distinguish him from another apostle with the same name. His name always appears in the Bible along with his brother John. His ministry was mainly in Jerusalem and Judea. After his martyrdom, his body was transported to Spain and buried at Santiago de Compostela. That place became a great pilgrim center. James also preached in Spain. While he was in Spain, he found no positive outcome from his preaching. Mary, the Mother of Jesus bilocated and appeared to him in 40 AD on a pillar on the bank of River Ebro at Zaragoza and encouraged him stating that his mission would have great outcome. Blessed Mother asked him to build a church there in her name. She gave a pillar of jasper to mark the spot where she had appeared to him. James was known as the Beloved Disciple because of his close relationship with Jesus. Jesus selected him to be the caretaker of his mother Mary, while Jesus was on the cross. John wrote the Gospel of John, epistles of 1st John, 2nd John, 3rd John and the Book of Revelation. His ministry was in Asia Minor and he took good care of Mother Mary in Ephesus. While preaching in Ephesus, John was taken to Rome for trial. He was sentenced to death in boiled oil. He was miraculously saved and the emperor nullified his death sentence. He was expelled to the island of Patmos under Domitian, where he had a vision and wrote the book of Revelation. He was the only apostle who died of natural causes. After the death of Domitian, John was freed to Ephesus where he served the churches in Asia Minor until his death around 100 A.D. when he was 88 years old. Andrew was son of Jonas, brother of Simon Peter and a disciple of John the Baptist. He was one among the two who heard John the Baptist introducing Jesus saying, “Behold, the Lamb of God!” (John 1:35-37). He was the first to follow Jesus and was enthusiastic to introduce Jesus to his brother Simon Peter. (John 1:40-42). He was not outspoken like his brother Simon. However, he was passionate in preaching the gospel. He preached in Asia Minor (Turkey), Scythia, east of Turkey, Greece, and Macedonia. He faced martyrdom of crucifixion with boldness and courage. According to tradition he was crucified in the town of Patra in Greece in 61 AD by Governor Aepeas. When he was sentenced to be crucified, Andrew begged that his cross be different from his master’s because of his unworthiness to use the same type of cross. So, his was an X-shaped cross which is now known as St. Andrew’s cross. While on the cross for two days, he preached from there. Two-crossed fish is also used as a symbol of Andrew because he was a fisherman before becoming an apostle of Jesus and was crucified on the X shaped cross. Philip was from Bethsaida, the town of Andrew and Peter (John 1:44) and could be a fisherman. Philip was formerly a disciple of John the Baptist. After John introduced Jesus to his disciples, Jesus found and called Philip to follow him. (John 1:43). Philip immediately recognized Jesus as the Messiah. He was enthusiastic to introduce Jesus to Nathanael by telling him: “We have found the one about whom Moses wrote in the law, and also the prophets.” (John 1:45). So, from the very beginning of his discipleship, Philip was sharing the good news of Jesus’ ministry to others. Though Philip is not recorded in the Bible as professing faith directly to Jesus like Peter, Nathaniel or Thomas, he was convinced from the very beginning that Jesus was the Messiah. Philip is assumed to be in charge of supplies and food for the team of Jesus and his apostles. Before feeding the 5,000 listeners of Jesus by the multiplication of loaves, it was to Philip that Jesus asked, “Where can we buy enough food for them to eat?” Philip answered: “Two hundred days’ wages worth of food would not be enough for each of them to have a little bit.” (John 6:5-7). Philip preached in Greece and Turkey and was stoned and crucified at Hierapolis in Persia in 62 AD. He was crucified upside down like St. Peter. His feast is celebrated on May 3rd in the Catholic Church. Nathanael, also known as Bartholomew, was from Cana in Galilee. (John 21:2). Philip introduced Jesus to Nathanael. When Jesus saw Nathanael, he said of him: “Here is a true Israelite. There is no duplicity in him.” (John 1:47). Response of Nathanael to Jesus was a profession of faith: “Rabbi, you are the Son of God; you are the King of Israel.” (John 1:49). Jesus promised Nathanael: “Amen, amen, I say to you, you will see the sky opened and the angels of God ascending and descending on the Son of Man.” (John 1:51). Nathanael preached in India and then at Asia Minor. He was martyred by skinning alive in Armenia in 72 AD. Matthew, also known as Levi, was son of Alpheus and lived in Capernaum. Levi was Hebrew name and Matthew was his Greek name. James the lesser was also son of Alpheus. So some people consider that Matthew and James the Less were brothers. Before following Jesus, Matthew was a tax collector or publican. Publican means someone engaged in public service or in handling public money. Tax collectors were considered as traitors and outcasts by their fellow Jews because they were collecting tax for Romans who were their pagan oppressors. The tax collectors were hated as exploiters because they used to collect unjust amount from the Jews than was necessary to pay to the government. That was why John the Baptist told the tax collectors, “Stop collecting more than what is prescribed.” (Luke 3:13). Jesus selected such a hated “criminal” and made him his apostle. When Jesus called Levi, he left his profession and enormous wealth to follow Jesus. He used his skills to write the first gospel that was intended for the Jews proving that many prophesies of the Old Testament about the Messiah were fulfilled in Jesus Christ. Matthew preached in Egypt and was killed with a spear in Ethiopia in 65 AD. Thomas was his Hebrew name and he was also known as Didymus in Greek which means twin. His twin brother or sister is not mentioned in the Bible. He is believed to be of the same age of Jesus. He expressed his boldness to die for Jesus when the other disciples discouraged Jesus from going back to Judea to see the sick Lazarus saying: “Rabbi, the Jews were just trying to stone you, and you want to go back there?” (John 11:8). Thomas encouraged them saying: “Let us also go to die with him.” (John 11:16). However, Thomas was not at the foot of the cross when Jesus was crucified. He doubted the resurrection of Jesus when other disciples said that they had seen the Risen Lord. So Thomas is nicknamed as “Doubting Thomas." However, he expressed his great faith in the Lord by declaring to Jesus, “My Lord and My God.” (John 20:28). Thomas preached in Parthia, Persia and India. While he was abroad, the Blessed Mother Mary died and he reached at her home on the third day after her death. Upon his insistence, the tomb of Mary was opened and her body was not found. Thomas saw Mary being taken up to heaven. Thomas was stabbed to death by a spear at Mylapore in India in 72 AD. This has some similarity to the death of Jesus because the heart of Jesus was pierced by a spear. James the son of Alphaeus (Luke 6:15) and Mary (Mark 15:40) was known as James the Lesser or James the Younger to distinguish him from James the son of Zebedee who followed Jesus before him. According to some, he wrote the Epistle of James. There are believes that he was the brother of Matthew and Judas Thaddeus whose father was Alphaeus. James preached in Palestine and Egypt and was crucified in Egypt in 62 AD and then his body was sawed to pieces. Judas was named Thaddeus that means “big hearted” to distinguish him from Judas Iscariot who betrayed Jesus. According to tradition Thaddeus preached in Assyria and Persia and was martyred in Persia. He was also known as Judas the Zealot because of his enthusiasm to see Jesus ruling the world. At the last supper, he asked Jesus: “Master, then what happened that you will reveal yourself to us and not to the world?” (John 14:22). He wanted to publicize Jesus as a ruling king. Judas Thaddeus preached in Edessa and healed Abgar, the king of Edessa. He was clubbed to death at Ararat. Simon is named as Simon the Zealot in Luke 6:15 and as Simon the Cananean in Matthew 10:4 and Mark 3:18. Cananean did not mean that he was from the original inhabitants of Canaan. In Hebrew, Cananean is equivalent of Zealote in Greek. He must be a member of the Zealot group before joining the group of Jesus. The Zealots were a group of revolutionaries organized against the Roman rule. Their hatred to Rome later led to fight against Romans and the destruction of Jerusalem in 70 AD. Unlike Matthew who was pro-Roman, Simon was anti-Roman. Jesus selected both with opposing views in his band and made them people of true faith. Simon worked, suffered and died for the true Kingdom of God that Jesus established. According to tradition, Simon preached on the west coast of Africa, and then moved to England where he was crucified in 74 AD. Others say he, after preaching in Egypt, accompanied St. Jude to Persia and martyred in Edessa in 67 AD. (19) and Judas Iscariot who betrayed him. Judas is believed to be from Judah near Jericho, whereas the other apostles were from Galilee. He was treasurer of Jesus’s group. St. John reports that “he was a thief and held the money bag and used to steal the contributions.” (12:6). Jesus was aware of what Judas was going to do. During the public ministry Jesus said to the Apostles: “’Did I not choose you twelve? Yet is not one of you a devil?’ He was referring to Judas, son of Simon the Iscariot; it was he who would betray him, one of the Twelve.” (John 6:70-71). Even after walking with Jesus, listening to his discourses, and witnessing the miracles he performed for more than three years, Judas could not give his heart to Jesus. Some people believe that Judas was also a Zealot. He believed that Jesus the Messiah would overthrow the Romans and establish his earthly kingdom. Judas eventually lost his hope in Jesus and sold his master for 30 pieces of silver to his enemies. He might have also thought that since his master had escaped from the assassination attempts of enemies before, he might do the same that time also. When that hope was failed, he got depressed and hanged himself after his unsuccessful attempt to free the master by returning the money. (Matthew 27:3-5). Jesus died on the cross, not because of Judas or any of the enemies of Jesus but because he himself surrendered to offer as the lamb of God who took away the sins of all humanity. Jesus made use of them as agents in his sacrifice. After the resurrection of the Lord, the apostles selected Matthias to replace Judas Iscariot and to maintain the number of the original apostolic college as 12. Matthias was one of the 72 disciples of Jesus. 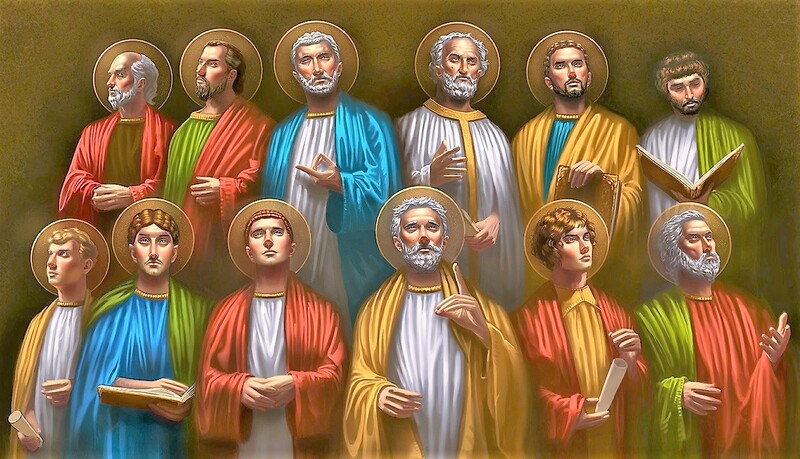 Common features of some apostles. - Peter, Andrew, James, and John were fishermen. Thomas, Nathaniel and Philip were also engaged in fishing. (John 21:2-8). - Peter, James and John were the inner circle of Jesus. - Peter, Nathaniel (Bartholomew) and Thomas made profession of faith to Jesus. - Mathew and John wrote the gospels. Mark and Luke were not from the initial apostles. - There were three sets of brothers. (1) Peter and Andrew, (2) James and John who were sons of Zebedee, and (3) James the son of Alphaeus, Judas Thaddeus the brother of James, and Simon the Canaanite or Zealot. - Simon, Judas Thaddeus, and James the Less were brothers as well as cousins of Jesus. - Peter, John, James, and Jude wrote epistles. - Andrew and Philip were disciples of John the Baptist. - Peter and John accompanied Jesus to the high priests’ residence during the trial of Jesus. - Jesus nicknamed James and John, the sons of Zebedee as Boanerges. (sons of thunder). - Though Philip and James died on different dates at different locations, their feast is celebrated on the same day because, their bodies were moved and were buried together in the Church of the Twelve Apostles in Rome. - Matthew was a tax collector for Rome and so was considered as a public sinner. - Simon was a zealot. - Andrew was the first called by Christ to be his disciple. - Only Peter was given the keys of heaven (Matthew 16:19). - Only Thomas was absent when Jesus first appeared to the apostles. - Judas Iscariot betrayed Jesus and never considered as saint. - Only John was at the foot of the cross. - James was the first martyr among the apostles and the only martyrdom of an apostle recorded in the Bible (Acts 12:1-3). - Unlike other apostles, Jesus found Philip. - Among the apostles, only Peter had that privilege of Jesus changing the name. - Only Judas Iscariot was from Judea. Others were from Galilee. - Peter denied Jesus three times during the trial of Jesus. - John wrote the book of Revelation. - Peter’s name and activities are recorded in the New Testament more than any other apostle. - St. Peter was crucified upside down at Vatican Hills in Rome in 67 A.D.
- St. James the Great was beheaded in Jerusalem in 42 A.D.
- St. John the Evangelist had a natural death at Ephesus in 100 A.D.
- St. Andrew was crucified on an X-shaped Cross in Achaia at Patras in 61 A.D.
- St. Philip was crucified upside down at Hierapolis in Persia in 62 AD. -St. Bartholomew was martyred by skinning alive in Armenia in 72 AD. - St. Matthew was killed with a spear in Ethiopia in 65 AD. - St. Thomas was stabbed to death by a spear at Mylapore in India in 72 AD. - St. James the Less was crucified and then sawed to pieces in Egypt in 62 AD. - St. Judas Thaddeus was clubbed to death at Ararat about 65 AD. - St. Simon the Cananean was crucified at Caistor (Lincolnshire) England in 74 AD. - Judas Iscariot hanged himself (Matthew 27:5) at Aceldama in Jerusalem in 30 AD. 1. Jesus had a succession plan for his mission. We also need to continue this succession plan of transmitting the faith we have received from generation after generation to the future generations through our faith formation in families and parishes. 2. There was great diversity among the apostles of Jesus. Church also consists of this diverse people. However, Jesus wants us to live in harmony and work as a team for his kingdom. Jesus and his teaching should help us to stay together and work together. 3. Jesus selected Peter as the team leader of the college of apostles. Others respected his leadership in the early church. We have to respect the successors of Peter and the other apostles and their representatives who are the Pope, bishops, and priests. 4. The apostles gave up everything they had including their house, wealth, and family to follow Jesus considering the Kingdom of God as their precious treasure. Their ministry was tough. However, they still live in heaven and in the history of the church as role models. Let us work for the treasure of the Kingdom of God. 5. Apostles were of different views like Matthew the tax collector and Simon the Zealot. However, they reconciled their different views to adapt to the views of Jesus and his message. We have to surrender our egos for Jesus and his church. 6. There were misunderstandings and failures in the lives of the apostles during the public ministry of Jesus. They were competing for positions. Peter tried to prevent Jesus from facing suffering and crucifixion. He even denied Jesus three times during the trial of Jesus. Jesus forgave their mistakes when they repented. Judas could not seek forgiveness. Let us reconcile with God when ever we deviate from Him. 7. Even after walking with Jesus, listening to his discourses, and witnessing the miracles he performed for more than three years, Judas could not give his heart to Jesus. Let us remember the words of Jesus: “For where your treasure is, there also will your heart be.” (Matthew 6:21). Let Jesus and his Kingdom be our treasure.